"Fighting in a Burning House"
J’Ula beheld the odd, vicious human blade in her hands for a moment before setting it upon the desk in her quarters. It was a prize, presented to her by the leader of her personal guard, taken from the hand of a dead Starfleet security officer. Kukri, the humans called the blade. It was truly a warrior’s weapon. The officer who once wielded it killed eight Klingons in close combat before finally succumbing to his wounds. But he was a fool, this human. He fought alone against overwhelming odds, trapped in the belly of his ship after all of his comrades had died or surrendered. He fought in a burning house, she mused. He suffered the fate of all fools. Her vessel streaked through space at high warp. Valuable information was gleaned from Starfleet prisoners, and from captured data files taken from the “burning house” so bravely defended by the human with the vicious blade. She’d learned of a Federation supply line and, in studying it, learned where it was most vulnerable… especially to a ship with the vaunted cloaking technology. Its treasures would soon be hers. Such treasures would keep her crew’s spirits high. It would keep this mighty vessel strong. Lukara. She had named her ship after the wife of Kahless, a true champion of the Empire… and forever in his shadow. Always it had been so. Men honored Kahless, yet without Lukara, he would have been a stain under the boots of Molor’s warriors in the Great Hall of Qam-Chee. A warrior, lost and unsung. But no. Kahless was a legend. Her brother T’Kuvma worshipped him, walked in his footsteps, and sought his light. Like Kahless, T’Kuvma found eternal glory in death, but J’Ula was determined not to be a woman in a great man’s shadow. She honored Lukara, but she would not follow her path as her brother followed Kahless. Her path led to a vastly greater glory. 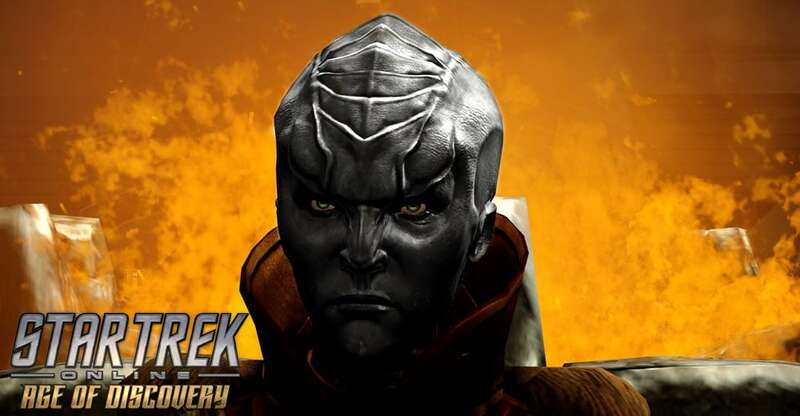 Before the war, when T’Kuvma came to Qo’noS with his mob and his fables, brashly confronting the High Council and warning them of impending Federation attack… she believed him. She told him so, when others scoffed. Pledged to champion his cause before the Great Houses, to make them see the truth in his words. And he rejected her, denied the bond of the blood they shared, and turned his back on her. “I no longer have a sister,” were the last words he said to J’Ula. Rage still burned within him, rage at her perceived betrayal for marrying into House Mo’kai, for dissolving their own familial house. He found a way to unite the Houses against the Federation where she had not, but he would never see the glory such unity would bring. But House Mo’kai, and its matriarch, would bear witness to that glory. “House Mo’kai is rich in one of the most precious commodities of war, dear brother,” she said to herself as she watched the blur of stars move past proud Lukara. “Knowledge. It is our bat’leth, and a blade that strikes deep and true.” Her spies were everywhere – within the Empire and without. They spoke the language of the enemy, read their greatest works, and studied their greatest minds. On the battlefield of the mind, House Mo’kai stood unchallenged and undefeated. Let the men of the Great Houses sing their songs and addle their minds with bloodwine. Let them sneer at House Mo’kai, who do the dirty work beneath “honorable” warriors. While the Great Houses clashed with the enemy under the watch of the stars, the forces of Mo’kai sifted through the ruins of enemy vessels, settlements, and minds, gleaning every precious secret held within. Secrets. Once the cloaking device was a secret. Once revealed, it gave the Empire the key to many victories. But the Federation was filled with clever minds, and it was only a matter of time before they found the secret that would foil the cloak and deprive the Great Houses of their battlefield wonder. They would have to face their enemies directly once again, instead of striking from the dark. This is why they come to Mo’kai. They needed more secrets. They needed the knowledge to win. And it would be provided, of course. Glory to the Empire. But J’Ula kept a very precise ledger, and the debts of the Great Houses were growing larger with each passing day of the war. Debts she fully intended to collect. The men of the Great Houses were content to play political games with her husband D’Lor, the “leader” of House Mo’kai. Another fool, in another burning house. The day would come soon when all debts would be collected, and her ascendancy would be all but inevitable. What is an empire without an emperor on the throne… or an empress? Hoch ‘ebmey tIjon, the wise often say to fools. Capture all opportunities. There were many opportunities to seize, and J’Ula intended to capture them all.